I have to admit it's been quite awhile since I've tasted a Dolcetto and I'm excited to refresh my memory. 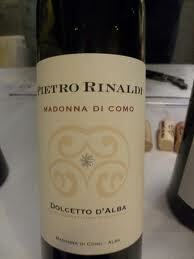 The 2010 Pietro Rinaldi Dolcetto d' Alba is composed of 100% Dolcetto and was aged in stainless steel vats for 6 months. It's obvious to me that this wine was meant to be drunk fresh and upon release because of the truly vibrant aromas and soft quaffable structure on the palate. On the nose I get beautiful aromas of red and black raspberry, violet, mulberry, rose petals, and concord grape. The smell actually reminds me somewhat of many Beaujolais that I've had in the past. It's very fruit driven and fresh!